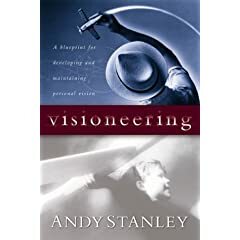 One of my favorite books of all time is Andy Stanley’s Visioneering. So many people wander through there life feeling like they have wasted so much time and opportunities. I felt that burden way early on in college and even my senior year in high school. I knew God was preparing me for a whole lot and I needed to make sure my vision was His vision for my life. I really didn’t understand that His vision must come first until my sophomore year of college when my heart just felt like I was being called back home. But, that is a different post. Anyways, I am rereading Visioneering in preparation for things to come in the months that are going to require much strength, faith, leadership and discernment on my part, and I know that all of that has got to come from God and not from me. For if I were to rely on my self, I would fail miserably. So, over more than 20 posts I hope to lay out 20 building blocks that Andy talks about in his book. This is moreso for my benefit and hopefully like my previous post to flow into your own awakening and search for God plan in your life.